Down in sleepy Nürtingen, the forward-thinking, German branch of Metabo has been hard at work structuring a cordless battery partnership that should provide the template for brand synergy that will likely kick off the dawn of a new era in cordless tool freedom and convenience. They’ve recently announced their partnership with eight, count them, eight other cordless power tool manufacturers. Their partnership, known as the Cordless Alliance System (CAS), represents the first of its kind among power tools, true leadership in the marketplace, and an example for other manufacturers to follow. But what heroes of the tool market make up this Cordless Alliance System, and what is this allegiance’s purpose? Under the new CAS, nine manufacturers of similar company size will team up to share the same battery and charger platform. Eisenblatter, Eibenstock, Haaga, Starmix, Collomix, Steinel, Mafell, and Rothenberger have all jumped into this allegiance. You probably haven’t heard all of these names before, but they’re, like, big overseas, probably. 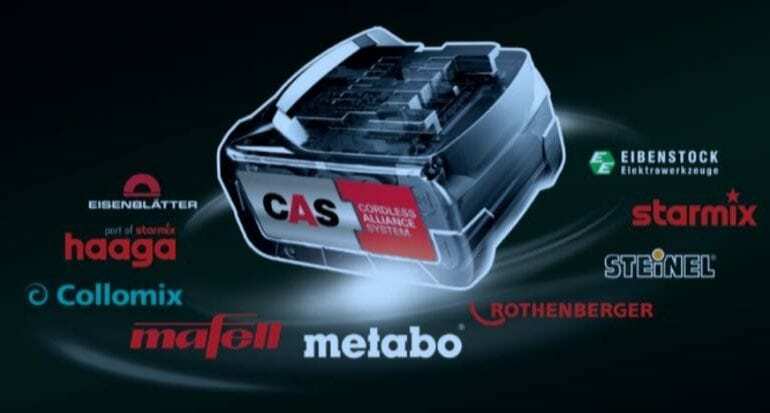 Now, users who have bought into any of these nine brands will be able to use Metabo’s 18V Lithium-Ion High-Density Batteries with their CAS tools. It’s not quite as awesome as showing the world truth, justice, and the American way. But, according to Metabo, “this [alliance] proves that Metabo is the most innovative and forward-thinking tool manufacturer in the industry today,” which is also pretty cool, I guess. Sure, some of Metabo’s press release quotes sound delusionally pompous, especially in the American market. But, to give credit where it’s due, the idea to join up with other smaller brands has some merit. Perhaps the Cordless Alliance System can bring about Metabo’s vision of both a cordless construction site and metalworking shop, all run on the same battery platform. If the idea takes off in Germany, there’s little doubt that more manufacturers in the American market will follow suit. This is what I’ve been wanting from DeWalt/Porter Cable for years. Once DeWalt switched to the slide packs and PC switched to 20V Max they should have taken the step. Maybe the new Craftsman will work with one or the other (not likely). Not likely at all. Craftsman has now launched, and even though some of the tools look like PC, they’re not compatible with batteries. This would be nice, but not happening. We agree this makes a lot of sense for the consumer/end-user. You can purchase the tools you need, regardless of the brand (assuming they’re one of the 8 listed), and power them with one line of batteries. Of course, Metabo is pushing this, and they’re manufacturing the batteries. We doubt the US tool companies will follow this model when there’s money to be made in selling batteries – or new tool kits.